When you think of employee wellness, you may jump straight to thinking about physical exercise and nutrition. Whilst both of these examples help improve employee wellbeing, they are only two small elements. 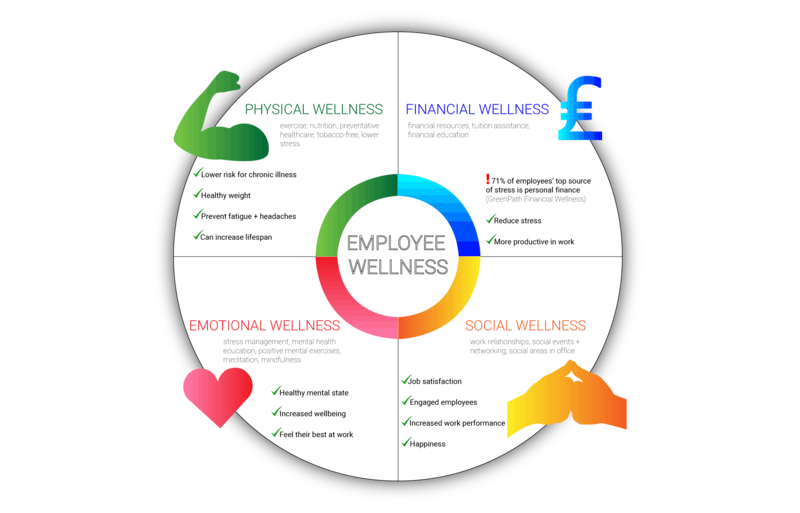 There are other important factors which have an impact on employee wellness. We have grouped these into the following sections: Physical Wellness, Financial Wellness, Emotional Wellness and Social Wellness. It is important to balance each of these sections in order to improve employee wellness as a whole. If and when your company offers education or assistance in these areas, it should be flexible so each of your employees can choose from a range of options which can be tailored to help them as an individual.